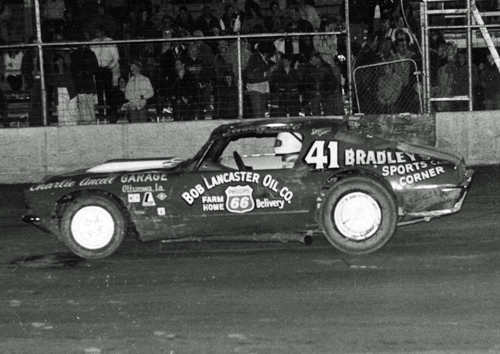 Oskaloosa, Iowa (July 20, 1972) - John Babb of Ottumwa made a clean sweep at the Southern Iowa Speedway here at the fairgrounds Thursday night. Babb won every race he entered starting with the first 10-lap super stock heat and finishing the evening with the feature win. 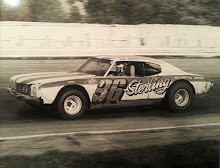 There was no stopping John as he had his little red #41 Pontiac Firebird out front every lap. In his second feature win here this season, Babb grabbed the lead at the start from his pole starling position and never relinquished it to take the victory. The wait of one night (because of rain) didn’t dampen the Firebird and John’s spirits any. 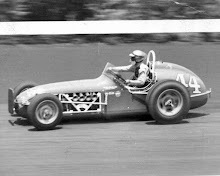 Joe Merryfield of Des Moines came up from his fifth row starting position to place second. Bill McDonough of Cedar Rapids finished third just ahead of Curt Hanson of Dike and Ron Hemsted of Lone Tree. Following Babb’s extra wide lead in the first heat was McDonough, Dan Clement of Rhodes and George Barton of Ankeny. Irv Janey of Cedar Rapids, driving the John Moss #1 car, won the second super stock heat. 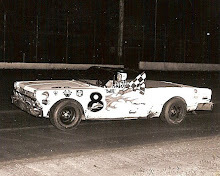 Janey was on Ron Hemsted’s bumper until the very last lap. On the second turn Janey managed to slip under Hemsted when he went a little high to take over the lead and the win. Don Hoffman of Des Moines was third followed by Larry Wasserfort of Waterloo. The third heat was just like the temperature - hot. Curt Hansen came out on top in that one. It was a bumper to bumper battle all the way with Sanger in the lead and Hansen and Merryfield right in there nipping at Sanger’s bumper. On the white flag lap Hansen overtook Sanger for the victory. Sanger and Merryfield finished second and third as they came across the line side by side. Chris Maurer of Colfax placed fourth. John Babb set a torrid pace for the field in the Australian pursuit event. With Babb out front and everyone attempting to catch him; not a single car was eliminated from this single file race. At the finish behind Babb were: McDonough, Hoffman and Merryfield. Red Dralle of Waterloo, after a four-week absence captured the 10-lap semi-main. Dralle led from wire to wire. John Meyer of Brooklyn and Ron Prymek of Iowa City were second and third respectively. 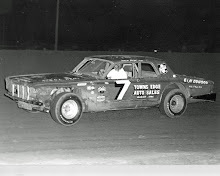 Gary Johnson of Newton held down second spot until the eighth lap came in fourth. Bob McCall of Ottumwa placed fifth with Joe Schaefer of Waterloo and Bob Bonzer of Liscomb following.